The filters are in excellent condition with no discernible scratches or dents. The threads are in great shape. We are not professionals. The item you see is the item you will receive. Item(s) included in this sale: Two Filters. OLYMPUS FILTER, 49MM SKYLIGHT (1A), LOOKS EX. We want you to be happy. You are responsible for them, and we do not know how much they will be. Including: Filter Case. We are appreciated to see many good people in the world. Now, it is my turn to give it back my appreciation by providing goods with reasonable price. This item works properly. OLYMPUS OM 72mm SKYLIGHT 1A FILTER. CONDITION: Like New in box. EX light wear. EX minor wear. EX normal wear. LN LIKE NEW. FLASH SYNC. WORKING PROPERLY. repair / part REPAIR or PART. GW good working. OLYMPUS OM 49mm SKYLIGHT A1 FILTER. CONDITION: Like New in box. OLYMPUS OM 55mm SKYLIGHT 1A FILTER. CONDITION: Like New in box. 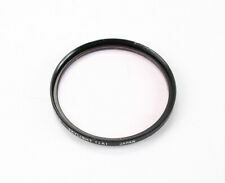 OLYMPUS ORIGINAL 43mm SKYLIGHT 1A LENS FILTER. FLASH SYNC. WORKING PROPERLY. This item is clean and beautiful. 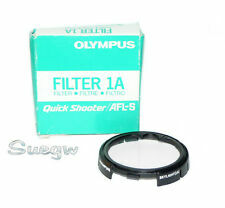 ONE Genuine OLYMPUS AFL skylight (1a) filter with case and box. Price is for one filter. USED, but still in good condition, glass clean. No other accessories are included. I cleaned the lens by the disinfectant. Excellent . Original Kenko (Protection / UV-HAZE) filter 55mm thread. I am already glad to help and resolve any issue at the best way. OLYMPUS 43mm lens filter. I will look it for you. However,I will provide courteous and responsive service. Its glass is clean and clear. THE FILTER IS IN GOOD CONDITION. THERE ARE A FEW MINOR LIGHT SCRATCHES AND MINOR DUST ON THE GLASS, BUT NO FUNGUS OR HAZE. As stated on our invoices See everything that we have currently. Warranty Period. THE FILTER IS IN VERY GOOD CONDITION WITH SEVERAL MINOR SURFACE NICKS. NO SCRATCHES, FUNGUS, HAZE, OR DUST MARKS ARE PRESENT ON GLASS. OLYMPUS SKYLIGHT 35.5 FILTER IN ORIGINAL BOX (pce128155). This item is fully checked and trusted. I am already glad to help and resolve any issue at the best way. FILTER is NEW in its original soft plastic case and box. Top-quality filter. Made in Japan. This fits any lens with a 49mm threaded filter ring, such as the standard lens (Zuiko 50mm f1.8) on an Olympus OM1, OM10 etc. Either way, no problem. Top-quality filter. This fits any lens with a 49mm threaded filter ring, such as the standard lens (Zuiko 50mm f1.8) on an Olympus OM1, OM10 etc. Either way, no problem. Olympus om system 49mm skylight 1A filter mint condition with case and leaflet. Skylight 1A. OLYMPUS 49mm Filter. Olympus L39 (UV) 49mm Filter Made in Japan. In Very Good Used Condition! Absorbs UV radiation to increase picture contrast and render more balanced colours. Olympus 49mm Skylight ( 1A ) Filter. Genuine Olympus. 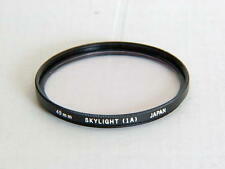 Sun 49mm Skylight 1A filter in excellent condition suit Canon Nikon Leica Minolta etc. High quality filter made in Japan. Glass is clean and clear No marks, No scratches, fully checked and tested ready to ”. Absorbs UV radiation to increase picture contrast and render more balanced colours. Make Supersized Seem Small. OLYMPUS 49mm SKYLIGHT (1A) Filter and Case. (NO SCRATCHES or BLEMISHES). The filter will give brilliant pictures and is ideal for landscapes and people as well as a handy lens protector against scratches and finger prints.